Colorado State University’s College of Veterinary Medicine and Biomedical Sciences lays claim to the only simulated canine with a virtual reality interface. The simulated canine, dubbed SimPooch, is in its early stages, but its creators say their project will revolutionize teaching in veterinary medicine. Narda Robinson, DO, DVM, MS, director of CSU’s Center for Comparative and Integrative Pain Medicine, initiated the SimPooch project in spring 2006, with Regina Schoenfeld-Tacher, Ph.D., coordinator of the college’s instructional design. They worked with a group of mechanical engineering students, who then constructed a physical model of a dog’s head that reproduced bone, muscle, skin and fat density to provide students real-life physical force feedback. The colleges of veterinary medicine and engineering then worked to create a 3-D dog model and software that will be rigorously tested for its effectiveness in teaching students proper acupuncture techniques. Dr. Robinson says the project was first met with skepticism. Since the concept involved merging two colleges, one of which knew nothing of medicine or acupuncture, success seemed unlikely. But the veil of uncertainty surrounding the project lifted when SimPooch won fourth place in CSU’s annual E-Days competition in which more than 100 displays vie for design recognition. Students can make mistakes with SimPooch without causing physical or psycological stress on an animal or themselves, which is one point that attracted Ben Cordova, an engineering student who created the haptics code for SimPooch. 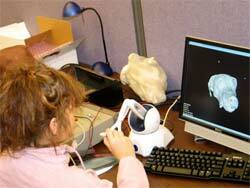 Haptics is the study of touch or tactile behavior. When a stylus is placed on SimPooch, the software records the point and determines whether the student locates it accurately. In the future, students will be tested on their insertion skills as they will be able to feel simulated tissue resistance through the stylus. Robinson says SimPooch will eventually include a trunk, legs and pelvis, but the current focus is working out kinks in the head. The project cost is expected to run $45,000 to $50,000, which is an obstacle. 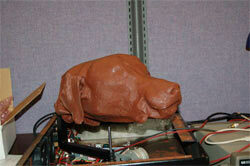 Creating the head alone cost $7,000 and cocupied an estimated 2,500 student hours and more than 100 veterinary hours. Cordova says from the engineering perspective, he wants to create a work flow that allows a veterinarian to begin with any MRI or CT scan of a dog and have a set of instructions on how to turn the data into an instantiation of the SimPooch project. “The software involves many technologies from graphcal and environmental programming to database engines to user interfaces and even some graph theory,” Cordova says. Robinson’s ultimate goal is to have not only CSU but all veterinary schools use SimPooch models for teaching acupuncture, pain management, biopsies, spinal taps and other invasive procedures to help reduce live-animal use in the early phases of veterinary education. A multitude of dog breeds and other species may eventually be created to provide a broader spectrum of virtual animal substitutes, saving live animals for use after students have ample experience. “We are documenting the effectiveness of SimPooch to ensure students are receiving a learning experience equivalent to that of live animal use,” Robinson says. Once the SimPooch prototype is perfected, Robinson says, she expects the product to be manufactured, with multiple mannequins made available to students, allowing access to a SimPooch around the clock. “SimPooch will eventually allow international students attending the medical acupuncture for veterinarians program at CSU to participate in hands-on learning without traveling to Colorado for onsite development of their acupuncture skills,” Robinson says. Computer software reproduces the head in a virtual-reality environment and also interfaces with the physical model. The software informs students and professors about the accuracy and precision of students’ acupuncture point-location techniques.